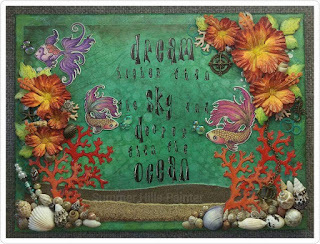 Mixed media canvas with Heartfelt Creations. Today I am sharing a canvas that I created a while ago. I totally love the Hibiscus flower from Heartfelt Creations. The paper collection has beautiful images that can be cut out with the coordinating die. Today I am bringing you a card that I created using the new Flowering Dogwood collection from Heartfelt Creations. I have always loved the Dogwood tree ever since I was a little girl. When I saw the sneak peek of the collection, I immediately called my local scrapbook store and pre-ordered it. Make a card base measuring 5" by 7" from pink cardstock. Cut a 4 ¾” x 6 ¾” layer from Pattern paper and layer onto the pink cardstock. Cut the border die out of white cardstock. Rotate the die and cut on the opposite side of the white cardstock. Using the outer edge of the coordinating die, cut the patterned paper so that when layered with the white piece, it will be offset. Adhere the two pieces together and attach with foam tape. Stamp the Dogwood flower on Vellum with Versamark ink. Apply a mixture of the White Embossing Power and Gold Embossing Powder and heat set. Cut out with the Coordinating dies. Ink the edges with Archival Plum and Memento Elderberry inks. Stamp the Dogwood leave with Cottage Ivy Memento Ink. Using sponge daubers, color the leave with New Sprout and Bamboo Leaves Memento Ink. Stamp the Berry Blossoms in Lulu Lavender Ink, color with Hydrangea Ink using sponge daubers, and cut with coordinating die. Stamp the Botanical Rose leaves with Cottage Ivy Memento Ink. Using sponge daubers, color the leaves with New Sprout and Bamboo Leaves Memento Ink. Watch this video to learn different shaping techniques using the dogwood flowers. Watch this video for tips on using the Regal Borders and Pockets dies. We are shaking things up! I know that it has been a while since I posted. I needed some time to reflect and get my creative juices flowing again. Since my time has ended with Elizabeth Crafts as a designer, my friends and I have gotten together and decided to do some challenges on our own. This month, we decided to do a "shaking" challenge. The project can be a shaker card, action wobbler, anything that will "shake" things up. Since Valentines day is today, I decided to my a shaker card for my hubby. For my card, I used the Pop It Up Cup Pop Stand die for cut out my window. The background and sentiment uses the Heartfelt Creations Coffee talk stamps and dies along with The Perfect Blend stamp set.